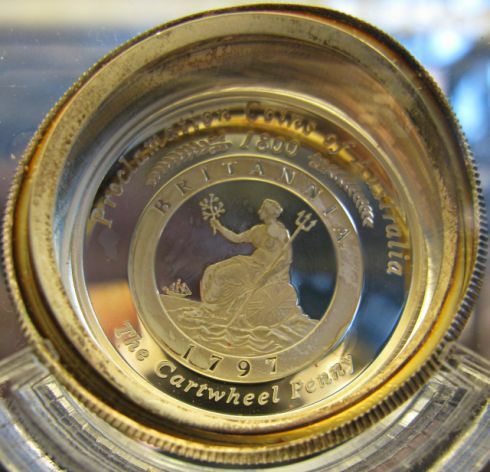 Above is an example of a type of coin error known as a die cap, bottle cap or bottle top coin error. 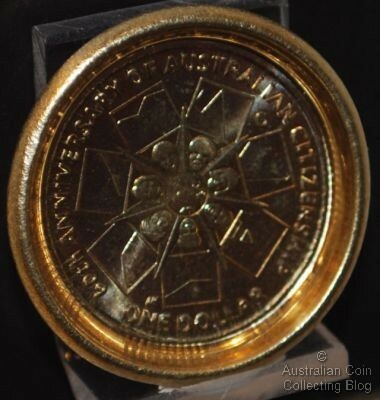 This particular coin is on display at The Royal Australian Mint in their First Floor display area showing visitors some of the types of mishaps that can occur to coins or the equipment during production. This coin is a Citizenship One Dollar which was the mintmark NCLT dollar issue for 2009. A die cap is a spectacular error coin indeed because it is the “parent” coin to potentially many, many brockages that may escape the mint. The die cap error occurs when a struck coin fails to exit the press and adheres to the hammer or moving die (which in the above error was the reverse die). The side of the die cap which was struck by the anvil die (which in the coin above is the portrait of the Queen) then starts striking subsequent coins rather than the die itself. This means that the next blank fed into the press will have a mirror image of the anvil die design struck into one side of the coin, this newly struck coin is now known as a brockage. The die cap, which is still stuck to the hammer die will continue to strike brockage coins and will become more and more dished in shape until it finally breaks free of the hammer die and exits the press. In extreme cases it has to be physically removed by mint staff when they notice a problem which is probably how the above example was found. As the sides of the die cap work their way up the sides of the hammer die it takes on the form of a ‘bottle cap’, which is another name that the die cap error is sometimes known by. As the die cap strikes more and more brockages the more and more distorted the face of the cap will become, and the quality of strikes to the brockages will be come worse and worse. Brockages struck soon after a die cap adheres to the hammer die with a well formed mirror image strike are known as ‘early state’ brockages. Those struck by a die cap with a largely obliterated design on the die cap face are known as ‘late state’ brockages and their mirror image strikes are pretty much unrecognisable.